Does your energy take a turn for the worse in the afternoon? Here are 5 ways to bounce back and recharge. Are you familiar with the mid-afternoon slump? You know, the fog that rolls in sometime between 2 p.m. and 5 p.m., without so much as a warning, destroying your will to do anything except curl up in a ball under your desk. You’re not alone. The afternoon slump is a real, biological phenomenon that lots of people experience every single day. In fact, it’s a sign your internal clock—fluctuations in energy and body temperature regulated by our circadian rhythms—is running on time. Clear away the haze with a few body-and-brain-boosting tricks—none of which involve pumping yourself full of caffeine or sugar. But that doesn’t mean the slump has to keep you down. Clear away the haze with a few body-and-brain-boosting tricks—none of which involve pumping yourself full of caffeine or sugar—so you can go forth into the world with a fresh mind. It’s hard to truly comprehend how much time we spend with our eyes widened by the glaring light of our phones, TVs, and computers. Not only is it physically straining, it’s also mentally draining. Place your hands over your eyes for two minutes, and relish the time you have to sit still and be with yourself. When you create an uplifted environment for yourself, your mind and body follow suit. Take a few minutes to clean up your desk, wash a few dishes, or straighten up your coffee table. It’s always worthwhile to extend yourself to others, so pick up the phone and feel your heart swell. It’ll make their day better; it’ll make your day better. There’s nothing like fresh air to perk you up when you’re feeling hazy. And if you spend your days in an office building, the air can get pretty stale. Get up and get out—even if you’ve only got five minutes to spare. It’ll get your blood flowing, your muscles moving, and will offer your mind a fresh start. 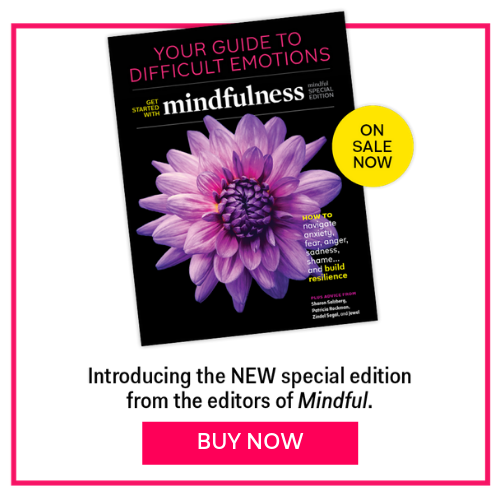 Claire Ciel Zimmerman is the deputy editor of Mindful.